It is being hailed as a lucky accident, after salvage teams searching for containers that fell off a ship in a storm discovered a 16th Century shipwreck on the North Sea floor. The ship, dating back to 1540, was filled with a cargo of copper plates and some of them were put on display on Wednesday when the find was revealed. It was owned by the Fugger family, one of Europe's richest banking families. The wreck is being described as "the missing link" in shipping construction. "It's the way the ship was built that's very interesting because you have to think 100 years later the Netherlands was in the middle of its Golden Age - and this ship is from a transition period," maritime archaeologist Martijn Manders told the BBC. When 345 containers fell from merchant ship MSC Zoe into the North Sea during a storm on 2 January, some spilled on to land in the next days, but many more remained in the sea. 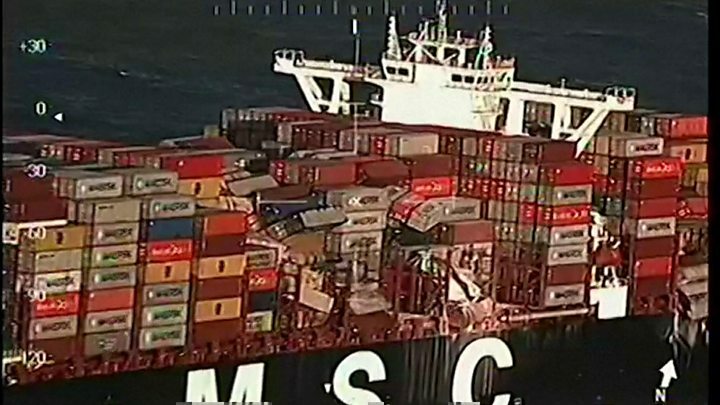 Media captionFootage filmed by the Dutch coastguard shows precariously balanced containers on board the MSC Zoe. As salvage teams scoured the Dutch North Sea, their sonar equipment found an unknown object on the seabed a few miles to the north of the island of Terschelling in the Wadden Sea. A full underwater expedition is yet to be carried out, but so far the salvage teams have lifted some of the copper cargo along with three wooden planks and 12 wooden ribs from the ship's frame. Underwater archaeologist Martijn Manders said the early 16th Century ship marked a period of transition in medieval history, when shipbuilders moved away from the traditional clinker-type model of overlapping timber. This ship too had elements of the old period, but featured the newer carvel system, with a hull made of planks flush at the seams. 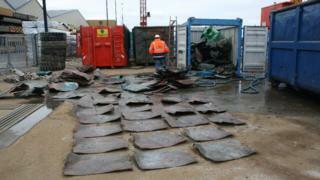 Experts believe the 30m by 7m ship could have been carrying as much as 5,000kg (five tonnes) of copper. "It was filled with copper plates, which have the stamp of the Fugger family - one of the richest families in the world," said Mr Manders, who traced the cargo's route from the family's copper mines in modern-day Slovakia and up the River Vistula to the Polish port of Gdansk. Its ultimate destination was the major port of Antwerp, in Belgium. "They were financing emperors and kings so they were enormously rich. They pushed away the Hanseatic traders so they hired Dutch ships to avoid working with them." Copper coins were at the time being developed as a lower-cost alternative to gold and silver, and it now appears that copper from the mines in Slovakia was being used as currency in the Netherlands. The find was put on display by the Netherlands' Cultural Heritage Agency on Wednesday, and Mr Manders said law enforcement officials had been asked to secure the wreck site.